Newport RI’s Illuminated Boat Parade…an insider’s view. Years ago, I was invited aboard a friend’s boat participating in Newport’s Annual Illuminated Boat Parade. It was cold that night…VERY cold. Bundled up in our warmest gear we headed out, excited for the adventure, thermoses of hot beverages in hand. We climbed aboard and started decorating stringing lights from bow to stern; with holiday music emanating from the speakers, we were ready for our first floating parade! The boat we were on happened to be the last in line which gave us a good view of the boats ahead and the spectators lining up along the harbor. And then…just before we were about to motor forward, the lights on our boat began to dim and the music began to fade. The battery on the boat was dying. But, as they say, the show must go on! With lights now darkened, we ventured on….We may have been invisible, but we were definitely audible belting out Christmas Carols as we motored past the docks teaming with cheering crowds. Looking back now, there is nothing I would change about that night…but for the frigid temperatures. In recent years, with children by our side, friends and family have chosen to experience the boat parade from by shore instead of by sea. It’s become a tradition to stroll through the shops on Bowen’s Wharf, pop into Saltwater or the Wharf Pub for a bite and a beverage. We then gather together along the docks of to watch as Newport Harbor comes to life with colorful lights. So my thanks goes out to all those hearty souls who brave the elements to bring us such a beautiful displays of warmth and good cheer to kick off another Yuletide year. Each year prizes for “best decorated” and “most team spirit” are awarded in a variety of categories from sailboat to Coast Guard vessels and everything in between; even prizes for most festively adorned dock or porch. With the mild weather this year the number of boats participating and the crowds on the wharfs seemed to be at an all time high. The honor of Grand Marshal was awarded to George Crowninshield, the Assistant Harbormaster and Retired Navy Captain. 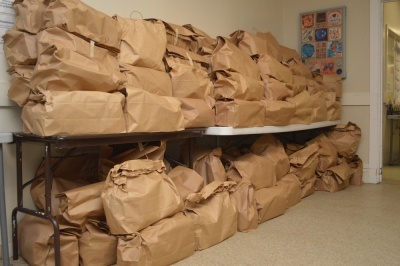 Donations of non-perishable items were collected at the Newport Yacht Club in support of the Martin Luther King Jr. Community Center. Contact the Newport, RI Harbor Master at 401.845.5815 or Visit the Annual Parade of Lighted Vessels Facebook page. Author: Michele Mullowney. Michele and husband, Jim live on Historic Hill in an 18th Century Colonial. WE WON! A NEWPORT RI CHRISTMAS MIRACLE! To our shock and amazement, not only did we win the Newport RI Doorway Contest, but we won Grand Prize! I am so grateful for my talented tenant, John LaPointe, he deserves all the recognition. A few years ago John made it his mission to help us decorate the doorway each year. As each season approaches, John begins to gather great varieties of greens and colorful branches with berries, all with his latest design in mind. Piles of evergreens and colorful berry branches quietly build in our back yard. And then the magic happens. Tirelessly and with amazing skill he begins building his design with diligent attention to the placement of each branch, bow and berry. (I used to try to help, but why fool with perfection). And so, each year, John has adorned our home with another beautiful creation, but the prize has always eluded us. Until this year! For years Newport has had a tradition of holiday door decoration. From colonial homes built before Revolution to Victorians and beyond, the homes in Newport beg for a little attention when the adoring crowds of summer have left the streets. One by one candles begin to light the windows and doorways festooned with fruit and foliage bringing a little cheer to the darkest days of December. It is rumored that when Colonial sea captains returned to Newport from the Caribbean and beyond, their families displayed the rare and coveted pineapple at the entry of their homes as a symbol of his arrival and to welcome visitors to their home. During early Colonial days the rare pineapple symbolized the utmost in welcome and hospitality to the visitor, and was often served as a special desert after the meal. 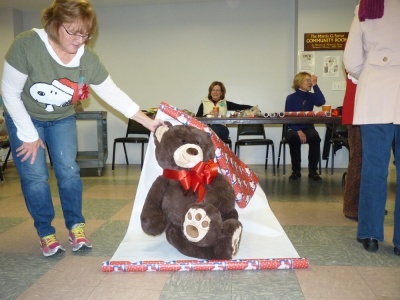 Each year a group of dedicated men and women from the CHRISTMAS IN NEWPORT doorway committee set forth to choose the best from among all the creative entries. They look for use of natural materials, variety and spirit. Prizes are awarded in many categories. In its 45th year,Christmas in Newport is a non-profit organization founded by Ruth Myers, that raises thousands of dollars for charity each year. LUCY’S HEARTH HOLIDAY WREATH SALE IS HERE! EACH HANDMADE WREATH AN ORIGINAL! For 45 years, “Christmas in Newport” activities have brightened the holidays here on Aquidneck Island. Nearly every day from December 1 through the New Year’s Day, diverseactivities showcase the wonder, joy and goodwill of the holiday season in Newport, RI. 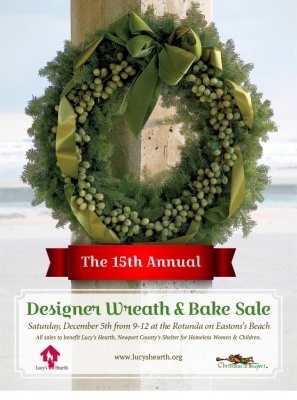 Each year my friend Jennifer and I look forward to the Lucy’s Hearth Designer Wreath Sale, which happens this Saturday, December 5th from 9 am to Noon at the Rotunda at Newport’s Easton’s Beach. There’s always a crowd, so it’s a good idea to arrive early. I guarantee you will see some friends, and it’s a great way to kick off the season! This year, Jennifer and I got together on Monday evening and made a variety of wreaths, using different plant materials and embellishments. After a long day at work, I wasn’t feeling too creative. As the Christmas music played in the background, and we chatted, laughed and got busy cutting greens, tucking in dried flowers, hydrangea and seed pods from our gardens, the tension of the day melted away, it all came to life, and we had great fun. We added sea shells gathered on our beaches and ornaments hung on our trees from years ago. Once Jennifer tied all the bows (she’s the one with the talent!) we had 7 works of art! 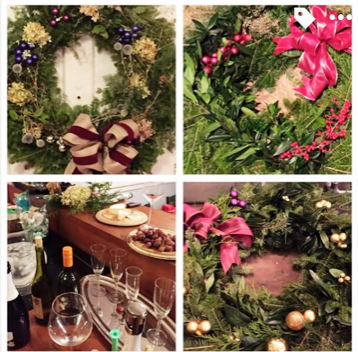 This is the 15th year Holiday wreaths and tabletop decorations, made by local organizations, designers, garden clubs and individuals like us are sold for the benefit Lucy’ Hearth. 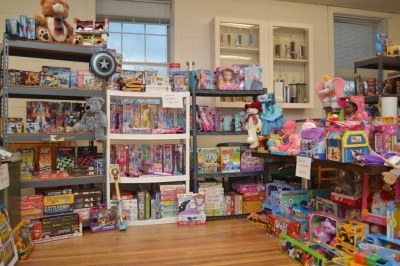 Lucy’s Hearth is in Middletown, RI and is a 24–hour emergency and transitional shelter for mothers and their children who are homeless due to economic hardship, family crisis, divorce, eviction and shortage of affordable housing. 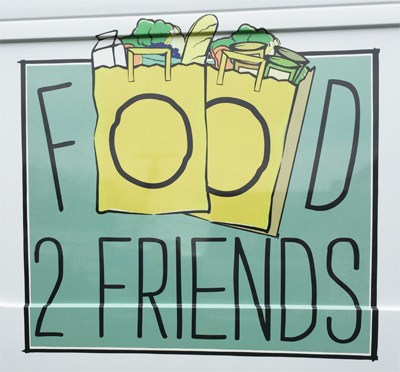 Their primary goal is to foster independence and to help the residents gain the life skills needed to prevent future chronic homeless. So, next year, consider gathering your friends and your creativity and design some wreaths to donate to this worthy cause. Not feeling creative???? Well then just come on by the Rotunda and buy a wreath or two, they make great gifts that will last through the holidays helping to support those in need all year long. For more info on the Christmas in Newport Activities call (401) 849-6454. “The Night Before Christmas,” a Newport Resident’s Classic Tale! For as long as my husband and I have been reading the famed “The Night Before Christmas” story to our children, we have adopted the tradition of driving through the beautiful Kay/Catherine area of Newport each year to show them the house in which the actual story was written. 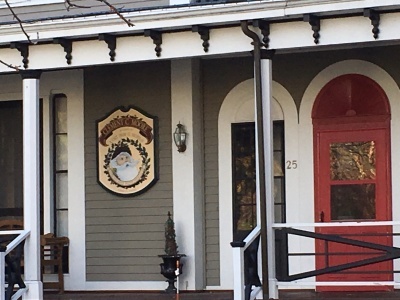 There is even a plaque of Santa Claus himself right on the front of the big, old, white Victorian home so that must mean it was written here right?? Before my children grow up to call their childhood memory of this seasonal tradition a big ole farce, I thought to do a little research on the author, Clement C. Moore. Did he really write the story and did he do so while residing at 25 Catherine Street? And to satisfy my literary curiosity further, I decided to examine some of the fascinating relationships between Newport and some very prominent authors that have called Newport home at one time or another. Many authors like Julia Ward Howe, who wrote Battle of the Republic, were from wealthy families who summered here. They were all well traveled and educated and returned year after year drawn to Newport’s natural beauty. Thorton Wilder, another Pulitzer Prize winner, first got his taste of Newport via the Army while stationed at Fort Adams during the final months of World War I. 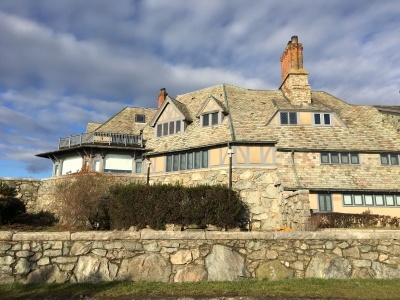 He later returned to Newport, staying at the Castle Hill Inn and wrote several great works including Theophilus North, which was later, adopted for film and shot here in Newport in 1987. But I digress. 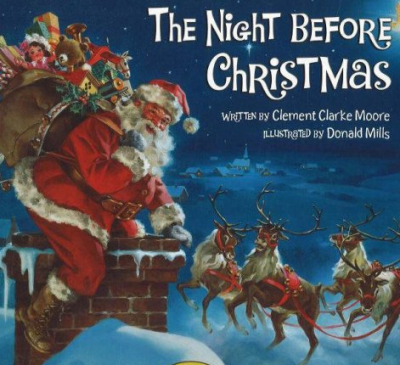 What about Clement C. Moore and “The Night Before Christmas”? While Moore is said to be the true author of the wonderful story, he did not write it here in Newport. He did not arrive to our fair city until the 1850’s and the story was said to have been written in 1822 somewhere else. However, I’ll continue to drive my children by the house, otherwise known as the “Clement C. Moore” house, and discuss not just the infamous story, but all the wonderful things about Newport that I want them to embrace and cherish. From famous authors and the stories that inspired generations of literary masterpieces… and the list continues to grow. One of the great things about living in Rhode Island are the cultural events this time of year. 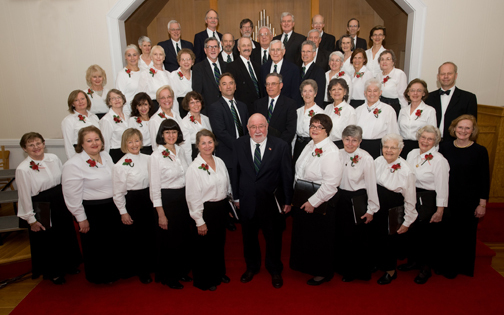 The Jamestown Community Chorus has been performing since 1949 and they will be presenting their holiday concert featuring Christmas Carols from Old England and New England. The 55 member choir will perform at 7:30 pm on the 12th and the following afternoon at 3pm. The public is invited to come and enjoy the music. For those who are wondering the chorus in a non profit, secular chorus made up of over 450 singers over time of its founding until now. Concert tickets are always available in advance at Baker’s Pharmacy, Jamestown Hardware and the Secret Garden. Also available at the door or by calling for reservations at 401-423-1574.